We’d love your help. 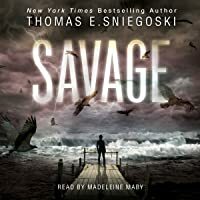 Let us know what’s wrong with this preview of Savage by Thomas E. Sniegoski. The future is looking bright for Sidney Moore as she gets ready to leave the small island of Benediction for one of Boston’s top veterinary programs. There are some bumps in the road to navigate—her father’s recovery from a debilitating stroke, her own guilt for ending her relationship with her high school boyfriend, and having to leave behind her deaf German shepherd, Sno The future is looking bright for Sidney Moore as she gets ready to leave the small island of Benediction for one of Boston’s top veterinary programs. There are some bumps in the road to navigate—her father’s recovery from a debilitating stroke, her own guilt for ending her relationship with her high school boyfriend, and having to leave behind her deaf German shepherd, Snowy—but she’s always been strong willed, with a passion to achieve her life’s dreams. Now a storm is bearing down on Benediction—a hurricane that will bring devastating winds and rain, rising tides… and something else. Something deadly. Something that will transform all the things that creep, crawl, and flutter into instruments of terror and death. Please tell me there is going to be a sequel!?!?!? Is there a planned sequel for this book? I don't know how I feel about this book. I liked it at first but it kind of became boring after a while. It was kind of confusing with all of the perspectives of seemingly random people. I think of core concept was really cool but the whole book seemed kind of like an original movie on the Syfy channel. I got some Sharknado vibes from this book. Overall, it was okay. I kind of regret paying $18 for this book when I should have just waited for the paperback. I wouldn't necessarily recommend this I don't know how I feel about this book. I liked it at first but it kind of became boring after a while. It was kind of confusing with all of the perspectives of seemingly random people. I think of core concept was really cool but the whole book seemed kind of like an original movie on the Syfy channel. I got some Sharknado vibes from this book. I wrote a review for this book and by the time I was able to articulate how much I didn't like it, my session had timed out and my entire review was sucked into the abyss. So now I have to start over. To start with, I haven't been this angry reading a book since Twilight, and losing my completed review didn't help. I finished reading it only so I could hate it more effectively. It had the ingredients for a good story, but unfortunately they were all combined so haphazardly that the resulting boo I wrote a review for this book and by the time I was able to articulate how much I didn't like it, my session had timed out and my entire review was sucked into the abyss. So now I have to start over. It had the ingredients for a good story, but unfortunately they were all combined so haphazardly that the resulting book was little more than a compilation of adverbs and melodramatic ellipses. It was written badly. If you've done any creative writing, you know that the rarer a word, the less you should use it; and that a scene can be improved by strengthening verbs and cutting out adverbs (generally). This book never met an adverb it didn't like, so I can't count the number of times "wildly", "insanely", "crazily", or "intensely" were used throughout the book. ("Wildly" was used three times in a span of two pages, actually.) Redundancies abound. "The wasps were aggressive in their savagery..." That one sentence is a good representation of what the entire book was like. Not to mention the setting and cast of characters were bland, and the relationships between them lacked substance. Doc Martin was entirely unnecessary. Thank God I don't have any pets. 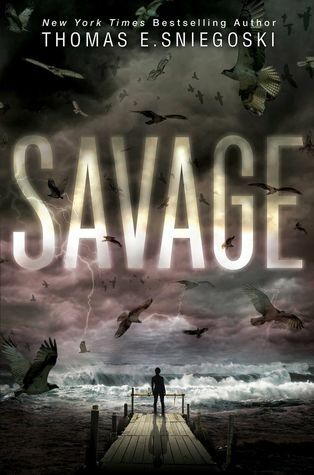 “Savage” reminiscent of James Patterson’s Zoo begins with a violent storm that changes insects, pets and animals native to the island of Benediction into rampaging, savage weapons hunting humans. The plot opens with Sidney Moore a young woman who’s about to enter veterinary school, leaving behind a recovering father, Snowy her deaf German shepherd and a shattered ex-boyfriend who hasn’t come to terms with their sudden breakup. Encountering a friend Rich Stanmore who needs help getting his sailbo “Savage” reminiscent of James Patterson’s Zoo begins with a violent storm that changes insects, pets and animals native to the island of Benediction into rampaging, savage weapons hunting humans. The plot opens with Sidney Moore a young woman who’s about to enter veterinary school, leaving behind a recovering father, Snowy her deaf German shepherd and a shattered ex-boyfriend who hasn’t come to terms with their sudden breakup. Encountering a friend Rich Stanmore who needs help getting his sailboat out of the water as the storm intensifies, she reluctantly enlists Cody’s help only to begin a terrifying adventure that will have the three escaping from the creepy, crawlies invading Rich’s house where they’ve taken refuge; fighting birds while trying to rescue the Harbourmaster; and confronting hunting packs of wildlife and dogs as well as a wave of sea life in their efforts to look for the veterinarian Doc Martin who they’re certain can unravel the mystery behind the violence of the animals. Into this chillingly horrific tale of survival, Thomas E. Sniegoski has woven subplots about a developmentally challenged boy who hears “bad radio” in his ear; Caroline Berthold’s murdered husband who becomes a zombie; veterinarian Doc Martin and scientist Dr. Gregory Sayid who are searching for answers to the weird and aggressive animal, bird and insect behaviour. Intensity, suspense and action build quickly with bloody attacks; a zombie; the sacrifices of police officers and parents; and crushing waves of animals that threaten anyone left alive. This book was creepy and awesome! Great story, so enjoyable, I just loved reading it! This review has been hidden because it contains spoilers. To view it, click here. Alright if you’re into weird natural disasters, big storms, nature vs man, disease, death, and science this book is pretty much for you. Savage is a book where the oddest things happen. There are many good, and bad components of this book. The weird twists and turns, and the strangest situations. I personally love this book. I can relate to some of the characters very well and others not so much. So that leads me into my first topic to discuss characters. The characters in this book are all in Alright if you’re into weird natural disasters, big storms, nature vs man, disease, death, and science this book is pretty much for you. Savage is a book where the oddest things happen. There are many good, and bad components of this book. The weird twists and turns, and the strangest situations. I personally love this book. I can relate to some of the characters very well and others not so much. So that leads me into my first topic to discuss characters. The characters in this book are all in very different situations on this strange town of Benediction. Benediction is a small island off of the main land. Which I assume is Massachusetts. So, Sidney I believe to be is the real main character out of this book is a girl who mainly grew up in the island with her father. Her mother died when she was younger I think before freshman year in high school. To me, I think it’s kind of a stereotype for one of the main characters parents to die in stories like this. But I do like how the author somewhat changed it to be the mom who dies. I feel like in most stories, the dad dies. Anyways Sidney also had a boyfriend named Cody. He’s a very important character in this story too. She broke up with him because they both wanted different things. I believe it’s very clever that the author made these characters have to work together despite the situation they are in. I also like use of people who have disabilities. I like how that the dog Snowy, and one of the side characters Isaac both have hearing disabilities. It opens up doors to show that people other than the average Joe can be affected by things like this. There are so many characters in this book, and I would like to just write a review about the characters, but I shall move on to another aspect of the story. The overall pace of the story was kind of rushing I think. The whole team of Sidney, Rich, Cody, and Snowy never really got a break to have something really suspenseful, and heart clenching really happen to them. If feels like they were just rushed into a lot of situations at once. I didn't feel as much suspense as I would've liked. I also want to point out that at the beginning when the lady who killed her husband, and then she ended up being killed by him, and the dog could’ve been way more suspenseful. I would’ve like it if she got to the point of disposing the body. Then the weird diseases caused by the storm started to take over his body, and killed her. Now for the plot; It was somewhat inconsistent I mean like the whole time it’s stupid decision after stupid decision. Who locks themselves in a bathroom for Christ sake? Also who thinks it’s a good idea to bring a boat up from the dock in the middle of a storm? It had the potential mostly it did, but if you’re a hard critical reader you wouldn’t like the plot. It also kind of uses a lot of repetitive words to describe certain things. Also the ending just got super crazy, I think it has a sequel I kind of want to read it. I don’t want to spoil the ending, so let's just say the word “what?” to describe what happened. I honestly think I would read the sequel to just clear everything up completely. What would you do if your small town was suddenly fighting for their lives from malicious monsters. Now, imagine those monsters as your loving pets, native animals, and insects. If one loves mystery, thriller, and the teeniest bit of romance this novel is for you. The name of this novel is Savage by Thomas E. Sniegoski. Sidney lives on a small island off of Massachusetts called Benediction. Sidney is getting ready to leave her small island and ready for a top veterinarian school in Boston. Howev What would you do if your small town was suddenly fighting for their lives from malicious monsters. Now, imagine those monsters as your loving pets, native animals, and insects. If one loves mystery, thriller, and the teeniest bit of romance this novel is for you. The name of this novel is Savage by Thomas E. Sniegoski. Sidney lives on a small island off of Massachusetts called Benediction. Sidney is getting ready to leave her small island and ready for a top veterinarian school in Boston. However, everything is paused when a massive hurricane comes bearing down on Benediction. During the hurricane, Sidney and her friends notice the native animals, insects and pets start to act very violent and barbarous. I guess one could say they were acting savage. The author was very eloquent with the way he worded this novel. The authors descriptive language makes one feel like you are living in the moment with the characters. An example of this is on page 86 chapter 15. “Sidney had never heard a clap of thunder so loud or seen a lightning flash so bright. On instinct, she had immediately dropped to her knees in the rain, blobs of undulating color writhing before her eyes in reaction to the nearly blinding flare.¨ One can imagine being there and being affected by this radiant flare. Another example of when I was transported into this book, is in chapter 26, on page 159. ¨Isaac ran through the thick underbrush that separated his family's property from his neighbor’s , driven by the terror he had just experienced. The ground was wet and slippery and fraught with hidden dangers.” I found this example to be one of the more vulgar examples. One could visualize themselves running with Isaac through his backyard while dodging all the objects that littered his backyard. The last example is on page 105 and in chapter 18. ¨Before reaching the stairs, he glanced up to the ceiling and saw that it wasn't just the floor that was crawling with life. Spiders. There were spiders everywhere that the light of the flashlight touched, and they all seemed to be heading toward him. Rich ran for the stairs. He could feel the bodies of the harder-shelled insects crunching beneath his sneakers as he ran across them, but that was nothing compared to the absolute horror that he experienced as he saw the spiders dropping down on their silken lines, some landing upon him and crawling up toward his face at incredible speeds.” This was another example of an unpleasant experience for the reader. One could feel the prickly hairs of the spiders on one’s neck. I would recommend against reading this chapter at night. I did and it made me feel uneasy. When I bought this book I was very excited to read it. I feel like this book was full of potential but the writing wasn't good, I didn't feel like I cared for the characters and I was very frustrated with the continuation of so many different perspectives. I kept wanting the story to move forward and when it seemed like something exciting was going to happen, the story would change to another perspective that I honestly had no care or interest for. I think it could have been much stronger if thi When I bought this book I was very excited to read it. I feel like this book was full of potential but the writing wasn't good, I didn't feel like I cared for the characters and I was very frustrated with the continuation of so many different perspectives. I kept wanting the story to move forward and when it seemed like something exciting was going to happen, the story would change to another perspective that I honestly had no care or interest for. I think it could have been much stronger if this book was written in the first person perspective of Sidney, that way it would have gotten rid of so many unnecessary characters and their different situations that only slowed the story. The main character, Sidney, definitely needed some work though. I found her to be kinda bossy and annoying, she didn't seem to have many good qualities and it seemed like she mostly only cared about her dog. So it was a surprise to keep seeing how much her two friends, Cody and Rich, seemed to like her so much. So I got this arc at yallwest a year ago and didn't pick it up until a couple of days ago. I needed a book to read in between phone calls at work and this book could not keep me engaged. There were endless characters. I wouldn't be able to tell you most of their names because none of them stuck out to me. They were all boring. They also all had something up with them. Could I tell you what? No, sorry. Moving on. All I knew about this book was there was a storm coming, and tbh that's all this boo So I got this arc at yallwest a year ago and didn't pick it up until a couple of days ago. I needed a book to read in between phone calls at work and this book could not keep me engaged. There were endless characters. I wouldn't be able to tell you most of their names because none of them stuck out to me. They were all boring. They also all had something up with them. Could I tell you what? No, sorry. Moving on. All I knew about this book was there was a storm coming, and tbh that's all this book gave me. A storm. On it's way. Here yet? Nope. Just on its way. I rather enjoyed this book! very suspenseful!!! I'd often find myself shrieking "don't open that door!" or "Are you crazy!?!?" or "oh my gosh!!! that is so gross!!!" or just plain "RUN IDIOT RUN!" the only reason this book is not getting a 5/5 is because I felt the ending fell flat. Perhaps There's no real good way to end a book like that, but the ending this author choose disappointed me a bit. Choosing an easy way out so to speak. I was really excited going into this story. The prologue definitely catches you with an iron grip & I was intrigued from the get-go. It starts out much like a Stephen King read - the delicious mystery drawing you deeper & deeper in. Then at the end it becomes like an H.P. Lovecraft - weird and just...stupid. Yanks you right out of the story with the stupidity of it. I was severely disappointed. Also, a warning to Animal lovers: do NOT read this. I loved that the main character was a strong female, I loved that the descriptions of what was happening were thorough and drove the fear home. The ending kind of sucked in that it was predictable, and overused. It would have been better with more creativity, but it was an entertaining read for the most part. I really enjoyed reading this book. I was almost turned off of it by some of the reviews here, but decided to read it anyway and I'm glad I did. The book was not a literary masterpiece, that I admit. But it was full of nonstop action, and it felt like a grade B horror movie. I love watching a great grade B horror, and I enjoyed reading this just as much. This was a really quick and easy read. I found myself surprisingly engaged, despite the fact that I hated Sidney, the main character. I wished Doc Martin had been the main character! haha I'm excited to read the next one! This book was very entertaining and full of action and mystery. I really liked it. Amazing story....started slow but got crazy fast. Lol. It was super scary n creepy and I loveed it. Already bought the 2nd book and its on the way in the mail. Cant wait to read it. too much build up, not enough resolution. became really farfetched in the end. the alien invasion part felt like a bit of a stretch. This is good, really awesome, there is no parts of feeling bored from the start to the end. Going to catch the second book and follow on with the story. Savage reads like a book based off of a Syfy original movie. It's like a bad, low-budget horror film, where the characters make consistently stupid decisions (and have no other discerning characteristics), and everyone dies horribly bloody deaths that are nothing but grotesque. Sidney Moore, the MC, is leaving her home island of Benediction to go to college. She's wrapping up her island life by breaking up with her longtime boyfriend and trying to figure out what she's going to do about her fathe Savage reads like a book based off of a Syfy original movie. It's like a bad, low-budget horror film, where the characters make consistently stupid decisions (and have no other discerning characteristics), and everyone dies horribly bloody deaths that are nothing but grotesque. Sidney Moore, the MC, is leaving her home island of Benediction to go to college. She's wrapping up her island life by breaking up with her longtime boyfriend and trying to figure out what she's going to do about her father, who recently had a stroke, and her beloved, snow-white, deaf dog, Snowy (how original, right?) A storm is coming to the island, nothing its inhabitants haven't been through before. But as the residents begin to batten down the hatches, they start to learn that this storm is different. Somehow, all the animals are becoming wild, thirsting for human blood. Say goodbye to characters with any depth whatsoever. Sidney is supposed to be the MC, but as a reader I feel like I know very little about her. This could partially be because of the writing style - third person, in short chapters that are usually between three and five pages, with every chapter shifting focus to a different character. Let's run through our character list, hmm? Sidney, her father (Dale), and her dog Snowy. Her ex-boyfriend Cody and his dad. Her friend, Rich. The island's vet, Doc Martin. Sidney's hoarder neighbor, Caroline, and her special needs son, Isaac. A woman named Janice who hates her husband, Ronald, and plans to kill him, and their creepy dog Alfred. A scientist who is studying strange storms and his team. Plus a list of random police officers and side characters. Adding all of this up, there are over thirteen people who are constantly talked about, the majority of which are give the focus of at least one, if not more, chapters. There is literally no time to learn about any of these characters other than their very basic characteristics. So by the end of the novel, I found myself not caring at all about any of the characters. Their tragedies don't make you sad, their victories don't make you smile. The pacing is horribly slow, and the plot is ridiculously repetitive. It's a good 100 pages (approx. 1/4 of the novel) before the big, scary storm actually starts. What happens in these pages? Honestly, not much. We spend a lot of time skipping between one character to the next, but it never really feels like a story is told. Once the storm starts, though, the animals begin to attack, all you read is the same scene over and over and over again. The characters get attacked by animals. They get bitten. They notice oh hey, there is something wrong with this demented animal's eye. They beat the animals, and notice oh hey, this animal doesn't seem to feel pain as I slowly beat the crap out of it. They move on. And it starts again. People are playing martyrs left and right. They come up with ridiculously stupid plans without a single educated thought to their basis. It's literally 400 pages of people running around like chickens with their heads cut off. The ending was super lame. It hints at a possible sequel (a book that I will be staying far, far away from.) The entire situation became more and more ridiculous as the book continued on, but the revealing of the source of the animals' craziness really took the cake. It was outlandish and laughable. Have not read a single thing from Thomas E. Sniegoski but from many people that do read his books I have seen mostly wonderful reviews. So that's a good thing and I am tempted to get into some more of his books. Did I like this book?? I liked it...I didn't love it...but yeah know I think maybe I was just not in the reading mood for this book. Again, I did like it...it had great parts of this story...actually great is not the word. The word I am looking for is straight up bizarre...insanity...I o Have not read a single thing from Thomas E. Sniegoski but from many people that do read his books I have seen mostly wonderful reviews. So that's a good thing and I am tempted to get into some more of his books. Did I like this book?? I liked it...I didn't love it...but yeah know I think maybe I was just not in the reading mood for this book. Again, I did like it...it had great parts of this story...actually great is not the word. The word I am looking for is straight up bizarre...insanity...I often stopped to ask myself "what the heck did I just read??" (HAHAHA). I think that is what intrigued me more and more through out the story. I needed to know where this story is going and I am actually wondering now as I type this review, will there be a part two?? Okay so if I am going to give a picture of what is going on...Sidney Moore, the main character in this story. She is expected to move away from her Island town of Benediction to attend Veterinary School in Boston. But things with the weather start brewing...nothing looks right...nothing feels right and whatever is going on it's going to be huge!! This is when the bizarre happens and let me warn you now, if you love animals...own your own animals...and are quite sensitive towards all things animals then this story might not sit well with you. But of course it's a work of fiction and should be enjoyed as such...but yeah, craziness ensues with all the animals in this fictional world. So back to what I said earlier. I liked the book but I did not love it. I feel that it could have held a little stronger at some moments where it began to get flat. The bizarro will surely keep you going though...I don't know how it wouldn't!! Savage is a title that is a true description of what this book is about....SAVAGE. It's a massive book so go into this story with the knowledge that you are diving into something substantial and long..but worth the read. THOMAS E. SNIEGOSKI is the author of more than two dozen novels for adults, teens, and children. His teen fantasy YA series Fallen was adapted into a trilogy of monstrously successful TV movies by ABC Family Channel. His other books for teens include Sleeper Code, Sleeper Agenda, and Force Majeure, as well as the upcoming series The Brimstone Network. The author's first adult novel, A Kiss Before THOMAS E. SNIEGOSKI is the author of more than two dozen novels for adults, teens, and children. His teen fantasy YA series Fallen was adapted into a trilogy of monstrously successful TV movies by ABC Family Channel. His other books for teens include Sleeper Code, Sleeper Agenda, and Force Majeure, as well as the upcoming series The Brimstone Network. The author's first adult novel, A Kiss Before the Apocalypse, hit the shelves in 2008, with its sequel, Dancing on the Head of a Pin to be released in 2009. “The organism - there was no other thing she could think to call it - churned and moved as it propelled itself across the ground, the living bodies of animals briefly appearing before being submerged in a sea of bugs as others rose to the surface. And then there were the bones. At first she didn't quite understand what she was seeing. For a moment she believed that they were pieces of wood - limbs of trees picked up by the undulating mass - but when she saw the skull, its jaw hanging open in a silent scream, she understood the horror of what it was.